Skywatcher and photographer David Paleino snapped this view of the total lunar eclipse of June 15, 2011 from Italy using a Fujifilm FinePix S2000HD camera. Before going to bed tonight, don't forget to set your alarm clock. A total lunar eclipse early Saturday morning (Dec. 10) is expected to offer lucky skywatchers stunning views of a bright red, supersized moon. A total lunar eclipse occurs when the Earth passes between the sun and the moon, casting the moon completely in shadow. The eclipse will start at around 7:45 a.m. EST (4:45 a.m. PST, 1245 GMT), when the shadow of the moon inches across the lunar disk. The celestial show will be visible from parts of North America, with those in the western portions of Canada and the United States particularly well placed for the event. People in Alaska, Hawaii, Australia, New Zealand, and central and eastern Asia should also be able to catch sight of the reddened moon. "For people in the western United States, the eclipse is deepest just before local dawn," NASA scientists said in a statement. "Face west to see the red moon sinking into the horizon as the sun rises behind your back. It's a rare way to begin your day." Skywatchers in the central time zone may get only a short glimpse, as the moon will set while it is only partially eclipsed, before the total stage begins, Alan MacRobert, senior editor of the magazine Sky & Telescope said in a statement. Unfortunately, people farther east will also miss out on the opportunity due to the setting moon and rising sun. 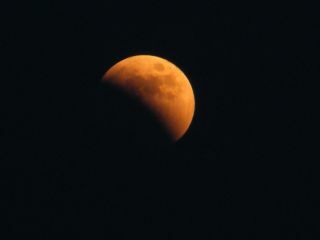 The lunar eclipse of August 28, 2007, was visible from Wrightwood, CA. But don't let location hold you back from enjoying the sky show. The skywatching website Slooh is broadcasting a free, real-time feed of the total lunar eclipse from Australia, Asia and Hawaii beginning at 8:00 a.m. EST (5:00 a.m. PST, 1300 GMT). Slooh's three-hour broadcast will allow interested skywatchers to watch online as the total lunar eclipse unfolds in real time. NASA's Lunar Reconnaissance Orbiter, which is flying 31 miles (50 kilometers) above the moon's surface, will also observe the moon during the eclipse and take some valuable measurements to determine how areas on the moon's day side cool off when it moves into Earth's shadow. Still, for those lucky enough to see today's eclipse with their own eyes, it promises to be a stunning show, NASA officials said. "Not only will the moon be beautifully red, it will also be inflated by the moon illusion," NASA scientists explained. "For reasons not fully understood by astronomers or psychologists, low-hanging moons look unnaturally large when they beam through trees, building and other foreground objects." In reality, the moon is not any wider, but the human brain sees it differently, and those in the western United States will notice that the moon looks supersized. And despite passing into shadow, the moon will be appear to be illuminated in dazzling reddish hues. "[T]he delicate layer of dusty air surrounding our planet reddens and redirects the light of the sun, filling the dark behind Earth with a sunset-red glow," NASA officials said. Depending on the state of the atmosphere at the time of the eclipse, observers can expect shades from bright orange to blood red. This should create a dramatic scene for interested photographers, and Sky & Telescope suggests using a long telephoto lens or even a small telescope to immortalize the special moment. In a video made by NASA, atmospheric scientist and eclipse expert Richard Keen, of the University of Colorado, offers advice for those hoping to view Saturday's show. "During the lunar eclipse, most of the light illuminating the moon passes through the stratosphere, where it is reddened by scattering," Keen said. "If the stratosphere is loaded with dust from volcanic eruptions, the eclipse will be dark. A clear stratosphere, on the other hand, produces a brighter eclipse. At the moment, the stratosphere is mostly clear with little input from recent volcanoes. That explains the brightness of the eclipse." It might also be possible to see a hint of turquoise as the bodies become aligned, he added. "Light passing through the upper atmosphere penetrates the ozone layer, which absorbs red light and actually makes the passing light ray bluer," Keen said. "This can be seen as a soft blue fringe around the red core of Earth's shadow. Look for the turquoise near the beginning of the eclipse, when the edge of Earth's shadow is sweeping across the lunar terrain." According to Sky & Telescope, the next partial lunar eclipse will happen on June 4, 2012, and should be visible across most of North America. The next total lunar eclipse will occur in April 2014. Editor's Note: If you take a photo or video of the eclipse that you'd like to share with SPACE.com for a possible story or gallery, please Clara Moskowitz at cmoskowitz@space.com or Denise Chow at dchow@space.com.